NASA is thinking of outfitting their Robonaut robotic device used for telepresence work in space with the many legs of their Spidernaut project. "NASA Johnson Space Center scientists and engineers think an eight-legged spider configuration on a Robonaut can perform work that would either be too dangerous or would require a level of control that would be difficult for a human in a space suit! Spidernauts are also being developed to utilize their own "web" or space tether technology to move between orbiting superstructures. With NASA plans to send a manned vehicle to Mars, asteroids and other destinations, the operational guidelines for the missions call for vehicles that are either too large or too fragile to be constructed here on Earth. NASA’s solution is to send several payloads into space to build new space stations that will become space-docks. These stations will be the staging points for the construction of the vehicles needed to support human life during long inter-planetary journeys. 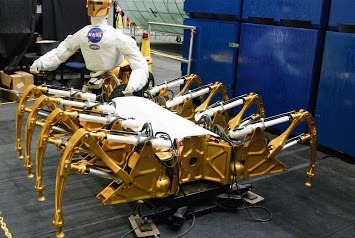 To help with the building process, Spidernaut extra vehicular robots (EVRs) will be deployed! The scientists at NASA liked the idea of using an arachnid-inspired EVR for the advantages its eight legs would bring to the table for space-borne construction. The Spidernaut even has the ability to create its own "web", just like a real spider, for use in traveling between two structures. Using space tethers, the EVR can create a support system that will allow it to "crawl" around to the different areas it needs to go. The two great ovoid bodies were hanging near the surface of the asteroid, about a hundred meters apart. The eight thin metallic legs were pointed downwards, balanced delicately a few centimeters clear of the surface. Between them, probing deep into the interior of the asteroid, was set the long proboscis. As Rob watched, the great, faceted eyes turned towards him. The Spiders were aware of his presence. Somewhere deep in their organic components lurked a hint of consciousness. Corrie had been fascinated by them from the first moment she saw one. "Why eight legs?" she had asked. Rob had shrugged. "It extrudes material like a spider. How many legs wouldi you have given it? From Friends of Nasa (on Google +) via Winchell Chung (@Nyrath also on Google +). Be sure to check out his Man Amplifier page on Project Rho.